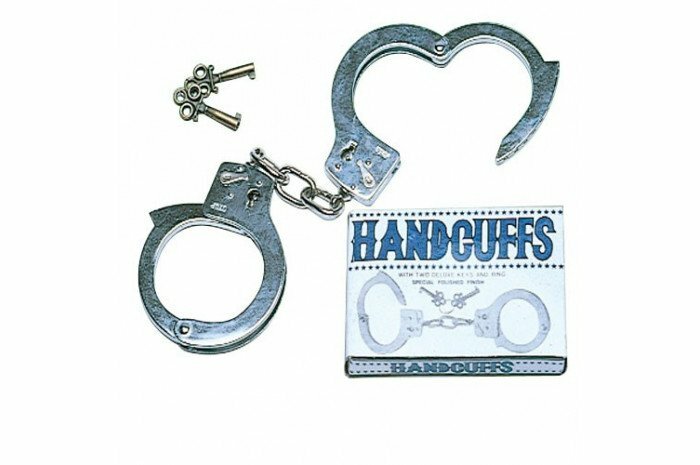 Handcuffs feature strong, all-metal construction and include a set of metal keys. Include safety release levers. I like these handcuffs a lot. They are sturdy, and hold up to some real pulling. Much better and more realistic than the cheap plastic ones I had before. What better way for a child to play out aggressive themes, than with a very well made pair of handcuffs. Many uses besides its intended use, by the way. A great thing to dig for in the sand. Used these handcuffs in the playroom for one day and they broke. Play Therapy Supply kindly replaced them. The quality of both sets of handcuffs is poor. Over the years I have seen the quality of the metal handcuffs decline. I wish a supplier could find a good quality handcuff that will stand up to childrens' play. Disappointed! I was really hoping for good sturdy handcuffs but they're not. They are made of metal. However, the key does not work in the lock so locking them is frustrating for the kids. They are flimsy they don't have a substantial weight to them. Disappointed. Handcuffs dont work very well and became stuck on a child's wrist! Talk about scary! I am putting these away never to be used again.